Cup of Small (Approx. 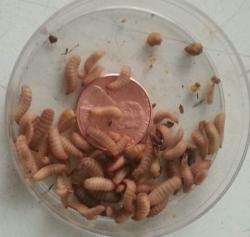 1/4'') Black Soldier Fly Larvae (100 Count)-$5 SALE! NOW ONLY $5 AS PART OF OUR "$5 SALE" - WHILE SUPPLIES LAST! BIG nutrition in a tiny package, Small Black Soldier Fly Larvae ("BSFL") are the perfect feeder insect for juvenile bearded dragons, small lizards, geckos, chameleons, turtles, larger dart frogs, etc. *Please note that we are always seeking out the best sources in order to provide our customers with consistent quality and availabiity of Black Soldier Fly Larvae ("BSFL"), and our BSFL may be a brand name such as Reptiworm™ or they may be another brand of quality BSFL that we offer as a superior quality option for those who want this small, nutritious feeder! Compare our BSFL to Reptiworms™, Phoenix Worms® and Calciworms® (all black soldier fly larvae sold under different brand name). We reserve the right to substitute another brand of BSFL according to our inventory, in order to meet our customers' needs. As always your feedback is appreciated. Thank you. Ready to serve, with no need to dust or gut load before feeding to your pet. Naturally nutritious, high in calcium, low in fat. Approximately 20 - 60 times more calcium than other commonly fed feeder insects. Contain high amounts of lauric acid which helps battle diseases such as Coccidia. No need to culture them. No need to feed them. Will stay in a jar lid--no escapees! Wiggle intensely, which will excite and entice your pet. Herps readily consume and relish them. Will stimulate the appetite of animals that do not readily feed -- great for picky eaters! Sized to satisfy most pets, including dart frogs, geckos, bearded dragons, chameleons, turtles, birds and more. The superior nutrition of ReptiWorms™ is great for hatchlings, helps gravid females or those who have just laid, and may halt or even reverse metabolic bone disease. BSFL are perfect for the person looking for an alternative to crickets, superworms, mealworms and waxworms. **DO NOT REFRIGERATE YOUR BSFL as normal refrigerators are too cold and can cause them to die. You can store your BSFL for several months if you keep them at 50-60 degrees F. When ready to feed, simply take out the amount of worms you want to feed and bring them to room temperature before feeding ... BSFL become more active as they warm up and even more appealing to your pet! SUBSTITUTION POLICY: Mulberry Farms reserves the right to substitute another quality brand of black soldier fly larvae on occasion if supply requires it.